After a long sojourn, a true Asiatic, aural nomad and supremely passionate musical alchemist, Tokyo-based producer/ DJ, owner of the label, Crosspoint, Moochy a.k.a. J.A.K.A.M. (Juzu A.K.A. Moochy), has arisen once again, with quite a unique project for 2015 entitled, Counterpoint. 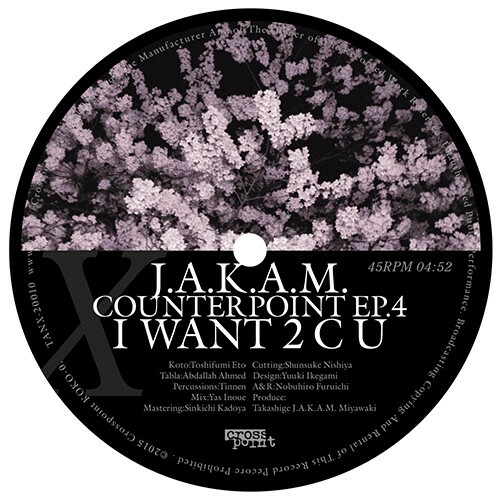 Starting from January, on the 11th of each month until September, Crosspoint will be releasing a 2 track single (mostly on either 12" or 7" vinyl format) of new material produced by J.A.K.A.M. For this endeavor, Crosspoint is collaborating with Toyokasei, the main Japanese vinyl pressing plant. Tracks included in these monthly singles will also be released on various digital sites as well. Since releasing his last album, Re:Momentos "Movements" 4 years ago, J.A.K.A.M. has traveled the world, to a wide range of regions such as the Middle East, Latin America and African continents, absorbing as much of the esoteric vibes in each culture and heritage as possible, and also collaborating with many local musicians. This new project, Counterpoint is the fruits of his eclectic musical journey. Each EPs are J.A.K.A.M. 's postcards from the edge, enthralled in potent sonic stimulus and messages, aimed at penetrating the deep consciousness. 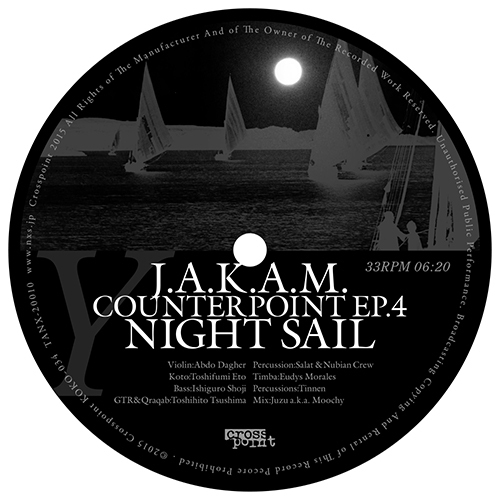 In Counterpoint, J.A.K.A.M. delivers his unique take on a new tangent, a genuine fusion of "counter point" musical integration that intertwines the diverse cultures with his Far-Eastern heritage and his own ever-evolving, refined, signature musical philosophy. Connecting the dots as only he can, this project tries to place a new "counter point", a new point of reference where a genuine evolutionary, creative energy reigns supreme. This EP was originally released on a 7 Inch vinyl single. Reminiscent of classic Pepe Braddock, Theo Parrish and inspired by Alice Coltrane's piece in the LP, Astral Meditations with a similar name, this slow, house burner, I Want 2 C U, keeps chugging along, as if drifting through the fog, following the mystic sounds of the Koto, played by Toshifumi Eto. Enter into a mesmerizing mystic vortex of Night Sail where Eto's Koto is intertwined with Abdo Dagher's Egyptian violin like a dance between the Far-East and Middle East strings, backed by a thumping house beat, interconnected by the Silk Road, like centuries past, present and beyond.